At Collectic Home, we take the stress out and guide you through the design process, from the conceptual idea to the execution, purchase, and installation. In the store or in your home – your choice. Arrange for a Collectic Home Design Associate to visit your home or office by calling us at 512.347.1616, come in to the store, or e-mail your request to us at info@collectichome.com. We review your rooms for ideal function and livability. Architectural drawings help us to anticipate potential problems and recommend changes. Our plans deliver a clean, scaled comprehensive view of the project. Feng shui is one tool to make a home feel warm and open. The design process begins by creating a distinctive color palette by using an inspiration piece, and then coordinating furnishings selected for your needs. We then incorporate the remaining essential elements of design including recommendations for flooring, window treatments and bedding, wall coverings, hand-painted finishes, artwork, florals, and accessories. We provide a complete schedule of project details to ensure accurate, quality completion of your project. It is an organization map that details colorizing, painting, lighting and electrical fixtures. This schedule is a perfect communication tool for you to use between us and your contractor or builder. 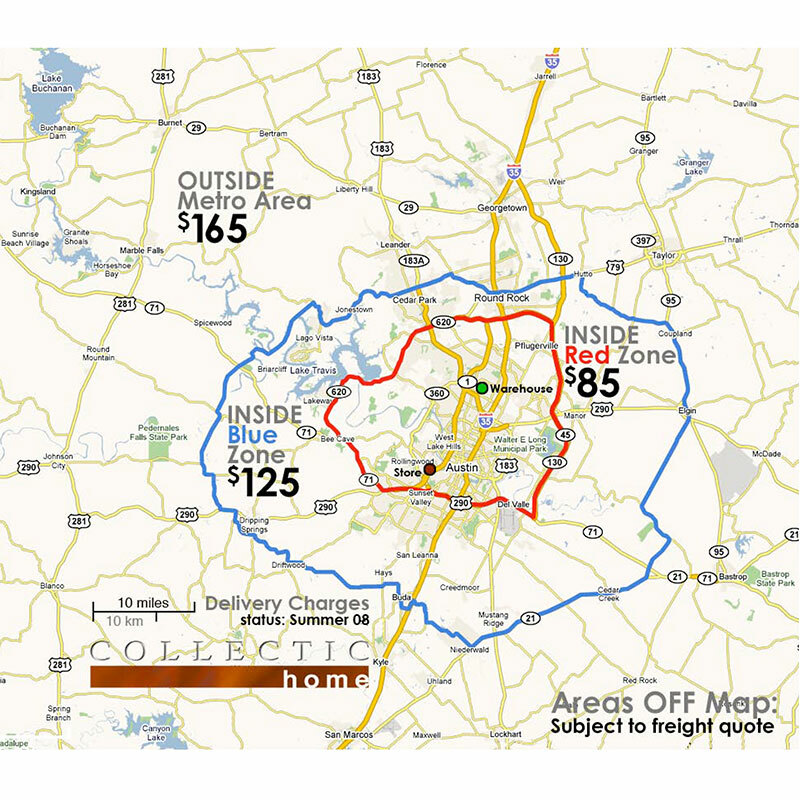 • Each visit within the Austin metropolitan area is charged at $75; $95 or $115 (RED, BLUE, and METRO Zones of our Austin, TX Delivery Charges Map, respectively). There is no minimum or maximum hourly limit, but most visits should take one hour or less, not including travel. • After your visit, our Design Associate will generally provide you with a recommendation for your consideration. This may include a quotation, floor plans, color boards, fabric selections, and sketches, depending on your needs and the complexity of the project. Under ordinary circumstances, there are usually no additional charges for these services. • The Design Home Visit charge is credited to your account if you make a Collectic Home purchase of $250 or more within thirty days of the Visit. • For visits outside the Austin metro area, we encourage our clients to first e-mail us digital photos of the area so we can discuss the benefits of a personal visit, agree on the travel charges, and make necessary arrangements. State-of-the-art: The Collectic Home On-line Room Planner. Click the link to open our Room Planner application. This easy to use software allows you to create a floor plan, then "populate" it with scale models of various furniture pieces. Low Tech: The Collectic Home Downloadable Room Planner Kit. Download our five-page Room Planner Kit that includes 1/4" scale graph paper, a template with 1/4" scale furniture pieces, and helpful tips. Before choosing furniture, consider the windows, doors, vents and electrical outlets in the room. Does a door open into the space? What about lighting: will you use table lamps, or would floor lamps work better? Next, measure the perimeter of the room and draw a simple floor plan to plot your furniture placement. Grid paper or either of our room planners work great! Your natural architect will come out. Don't forget to add the details to each room's standard furnishings. You'll want to plan for other items such as armoires, ottomans, and accent tables. A bench at the end of the bed or extra storage can make a difference in any room. Follow these simple guidelines to help ensure an efficient delivery. Remember to relay this information to our staff when scheduling your delivery. Measure the height and width of your entryways, including elevator doors, entry doors, and the door of the space where the furniture will be placed. Measure the furniture to be delivered and determine if it can go straight through entryways or if it will have to go in at an angle on on end. For upholstered furniture, such as sofas and chairs, measure the overall length, depth, back height and diagonal depth. Diagonal depth is helpful when determining if the piece can be brought in on end. To determine the diagonal depth: measure from the top of the back to the front of the arm. Find the mid-point of that measurement and measure from the mid-point to lower back leg. For wood furniture, such as armoires and bookcases, measure the overall height, width and depth. Diagonal height (from top left corner to bottom right corner) is helpful when determining if the piece can be brought in on a tilt. Make sure there is a clear and unobstructed path in front of and beyond each doorway. Make note of any fixtures, decorative moldings, and interior walls, ceiling heights, stairwells and hand railings that may pose an obstacle once inside.